Our skiers love Santa Caterina - join us in this picturesque, high altitude resort with an exemplary snow record and where queues for the lifts are virtually unheard of! Santa Caterina is a hidden gem. Set at 1,700 metres and with predominantly north facing slopes, this charming resort has an excellent season-long snow record. Santa Caterina's 2 distinct ski areas offer plenty of slopes for skiers of all abilities. There’s a well-placed beginner’s area at the base of the resort from where novice skiers can quickly progress to the summit of the resort, and the Santa Caterina Sun Bowl offers spectacular blue and red runs in an amazing landscape. The resort was the venue for the 2005 Alpine World Ski Championships, and has a run named after its local heroine Deborah Compagnoni, a triple Olympic gold medal winter. This piste is also floodlit at night for anyone wanting some picturesque night skiing! 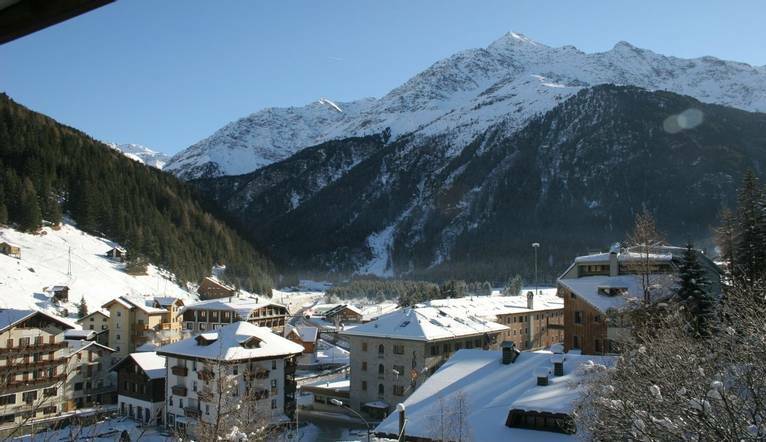 Santa Caterina is also part of the Alta Valtellina ski area, with access to 112 individual pistes, and the Alta Valtellina Lift Pass allows you to ski in the neighbouring ski resorts of Bormio and Livigno. With the resort itself lying so high, skiing back to the resort is usually possible for the majority of the season. Lying at one end of the Stelvio pass in the stunning Italian Alps, Santa Caterina remains a beautiful and traditional ski resort with its cobbled streets and virtually no traffic. Its quiet and compact nature means that everything is within easy walking distance, but despite its size, it still has a good selection of facilities and après-ski options on offer. This comfortable, family-run hotel enjoys a peaceful setting in the resort with beautiful views of the Alps. It lies just 150 metres from the Paradiso chairlift and 600 metres from the resort’s new 8-seater gondola which can be reached using the resort’s ski bus. Hotel facilities include a restaurant, a cosy bar and a wellness/beauty centre with sauna, solarium and hammam. All the comfortable rooms feature satellite TV, safe, hairdryer and free Wi-Fi connection. The transfer from Milan Airport to the hotel is approximately 4 hours, depending on weather and traffic. We suggest a Group Collection to cover transfer drivers, and hotel staff of €15.00 per person. Your Tour Leader will collect this on your behalf and distribute it accordingly, thus relieving you of the burden of who, when and how much to tip. The tipping of housekeeping will be left to your individual discretion (a small amount left in your room on departure should cover this and would be much appreciated). As is customary, ‘the hat’ will be passed around for the driver and guide on all optional excursions. For any meals that are not included in your itinerary, or taxi fares, your Tour Leader can advise of an appropriate % to add on. If you choose to have ski lessons, you may also like to thank your ski instructor at the end of the week with a token of appreciation.